Hertz Global Holdings Inc. has released its 2015 third quarter operating results. Total U.S. car rental revenue was $1.7 billion in the third quarter 2015, down 2% from 2014 third quarter due to flat transaction days and a 2% decline in total Revenue per Transaction Day (RPD), according to Hertz. However, as a result of a 3% improvement in fleet efficiency, Revenue per Available Car Day (RACD) increased 1% despite the 2% decline in RPD. Hertz reported a 5% decrease year-over-year in its consolidated total revenue for the third quarter — $3 billion compared to $3.1 billion for third quarter 2014, according to the company. Foreign currency exchange rates had an unfavorable impact on third quarter 2015 results versus third quarter 2014. Hertz estimates the unfavorable year-over-year impact to total revenue at approximately $144 million, according to the company. For third quarter, Hertz reported a net income of $237 million, or $0.52 per diluted share — an increase compared with net income of $149 million, or $0.32 per diluted share, for third quarter 2014. 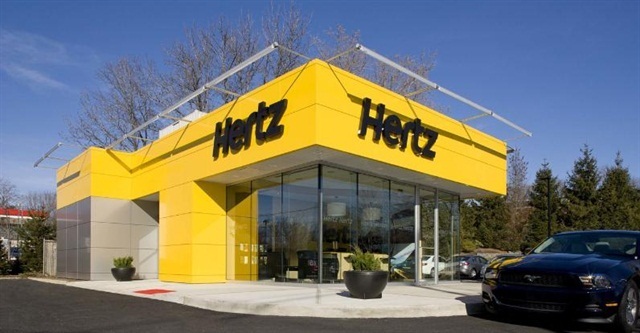 Hertz also reported the recent quarter’s adjusted net income was $226 million, or $0.49 per diluted share, compared with $203 million, or $0.44 per diluted share, for the same period last year, according to the company. Adjusted Corporate EBITDA was also up —$601 million versus $553 million in the third quarter of 2014. U.S. car rental fleet efficiency rose to 83%, an increase of three percentage points from third quarter 2014 due to improvements in out-of-service levels and higher rentable utilization. Hertz Global has successfully renewed its U.S. Car Rental fleet, while maintaining fleet cost slightly below 2014 levels through the first nine months of 2015. Through Sept. 30, 2015, the company added approximately 335,000 2015 model-year vehicles to its fleet, approximately 50% more than the comparable number of 2014 model-year vehicles through the same period in 2014. More new vehicles contributed to lower out-of-service levels and fleet maintenance costs for the third quarter. During the quarter, Hertz Global successfully migrated Dollar Thrifty operations to the company's common counter and financial systems, completing integration of the Nov. 2012 acquisition of Dollar Thrifty Automotive Group, Inc. Unrelated to its Q3 2015 operating results, Hertz Global filed a restated Form 10-Q for its second quarter 2015 indicating an increase of $21 million to pre-tax income and $13 million to net income (loss) for the three and six months ended June 30, 2015, according to the company. The restatement results from a prior period error related to the depreciation of vehicles sold through the company's retail car sales locations that impacted the financial statements filed in its Form 10-Q for the second quarter 2015. As a result of this error, depreciation expense — during the three and six months ended June 30, 2015 — was overstated by $21 million and $18 million, respectively, says Hertz.